Cole Haan is a global lifestyle and luxury brand, its origin was established in Chicago, Illinois, with the the intention of creating a remarkable global presence in its collections of fine footwear, apparel, and accessories for men and women. What began as a visionary partnership in 1928 between Trafton Cole and Eddie Haan has blossomed into a dynamic, forward-thinking fashion brand with celebrity in endorsements like tennis star Maria Sharapova. Cole Haan's prophetic use of sports technology in stylish footwear has accelerated the brand's success, with shoes such as the penny loafers, the genuine hand-sewn shoe, the multicolored boat shoe, and the all-leather court sport sneaker. At one time Cole Haan had been purchased by Nike. However in 2012, Nike sold the brand to Apax Partners Worldwide LLP. 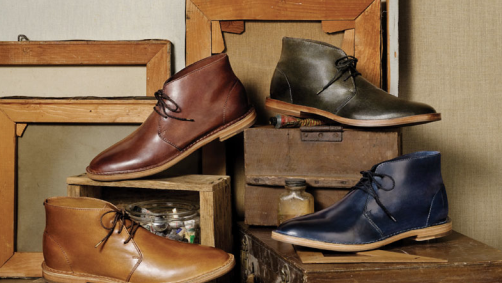 Learn about the men's Cole Haan footwear brand. They also design, market and sell Cole Haan women's footwear and fashion. Learn more about Cole Haan at their websites. View the Nike profile section here on Apparel Search. Return to the main page or the Fashion Company Directory.